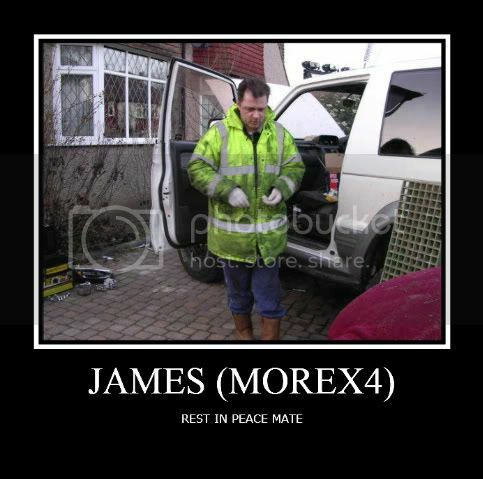 I have been reliably informed that, some time on Friday, 16th January, James Smith (more x 4) took his own life. He leaves behind his beautiful wife, Hayley, and their seven children. James was one of the earlier members of the POCUK and was one of the most generous, selfless, helpful people to have graced our community. I am sure that I speak on behalf of everybody here who either knew James, or has been helped by the legacy of support that still remains from him, within this community's forums, when I say that our thoughts and prayers are with him and those he has left behind. Posted: Mon Jan 19, 2009 17:59 Post subject: Google Ads keep the POCUK free to join! I have been advised this evening that James' funeral will be held on Friday 30th January 2009 at 4pm. I have been asked to say - "it would be great to see as many Pajero Owners as possible attend, to show their respects". Hopefully those who can make it will be there. PLEASE be sure to meet there NO LATER than 2:30. When you view the page, you can click on the picture to link to the memorial where I know you are more than welcome to leave your good wishes. Due to other commitments, I couldn't attend the funeral personally, but I hope that it was a dignified send off.